I hope those of you who celebrate Christmas have had a good couple of days with your loved ones. I’ve spent Christmas at my mother’s and ate more food than any sane person should. Oh well, it’s only once a year, right? In this first panel, we see Matt and Glorianna prepare for their party. So far, so good and no sign of any major disaster looming. Before the guests arrive, Glorianna takes a moment to give Matt his Christmas present, a replica of Rodin’s The Kiss. Matt seems to know his way around sculptures, and we even learn that he has his own sculpture room (though I think this may have been alluded to previously)! 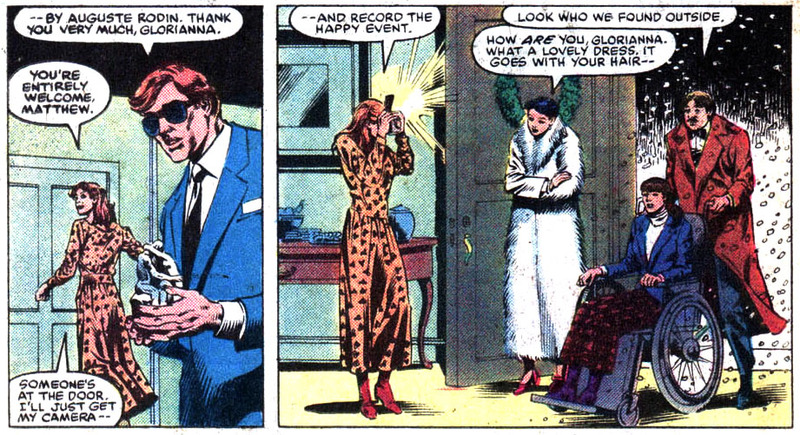 Lo’ and behold, it’s Foggy Nelson, his awful wife Debbie and Becky Blake! 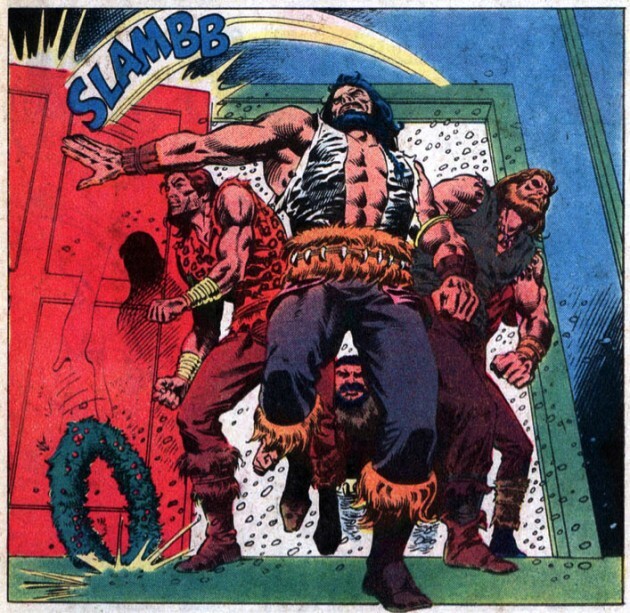 Maybe Glori should put the camera down though, that’s not the way I’d like to enter a party. Here, Debbie shows us her true colors by belittling her own niece. What a woman! Matt never warmed to Debbie, and it’s not hard to see why. Okay, what’s this? Matt, are you serving your guests toast? No, putting them on a platter like that doesn’t help. We also see Matt show off another one of his wacky powers (one I haven’t actually covered yet), by knowing that the phone is about to ring before it actually does. Does he hear the electrons moving through the phone wire or something? Anyway, it turns out that the snow outside is bad enough to prevent even his superhero friends Luke and Danny from attending the party. Bummer. And as we’re about to find out, he could have used some backup. …taking a hit to the stomach. But he wouldn’t be a superhero if he couldn’t come up with a decent plan on the spot, would he? 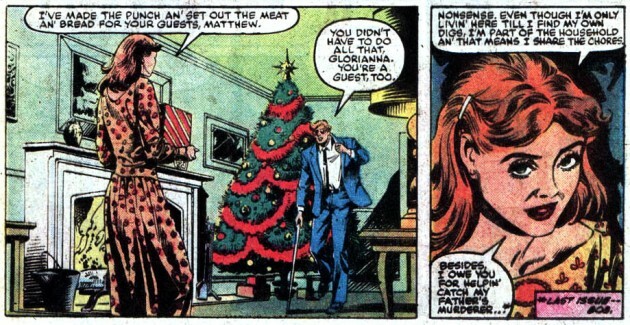 While being mocked mercilessly by Micah and his gang, poor Matt can think of only one thing: killing the lights so he can change to Daredevil. Apparently, every light in the room is somehow connected to the Christmas lights. Hmm. Oh well, probably not one of those plot points one should spend too much time trying to make sense of. 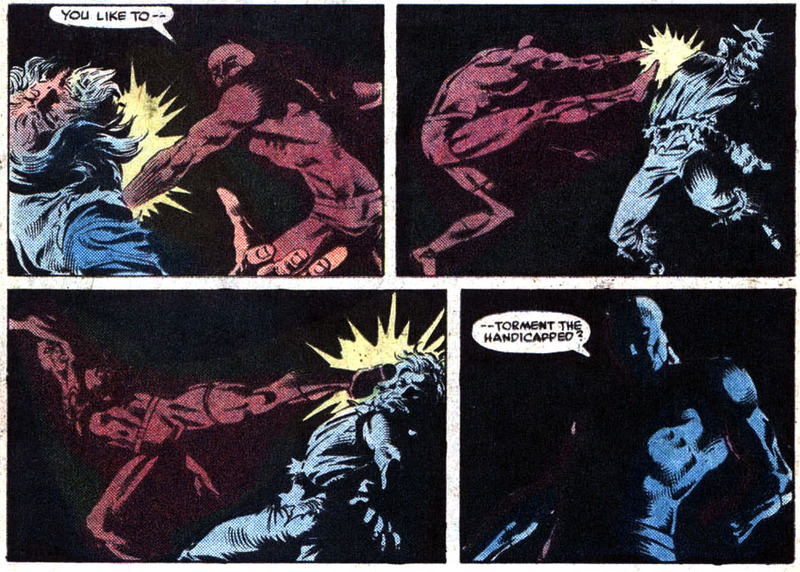 In the dark, Daredevil goes into action and gets his revenge. You get them, Matt! They ruined your Christmas party and harassed your guests. Mean bastards. Like any decent bar brawl, this tussle ends up outside. I really love the art in this shot, and the nice details with people’s breaths becoming visible in the cold air. Another thought that comes to mind, however, is how much I appreciate the fact that Foggy now knows that Matt is Daredevil. These kinds of scenes are really a stretch of the imagination and Foggy comes across as something of an idiot. With Daredevil showing up at such short notice while Matt is presumably whisked away to safety, you’d have to be Lois Lane not to wonder what the heck is going on. 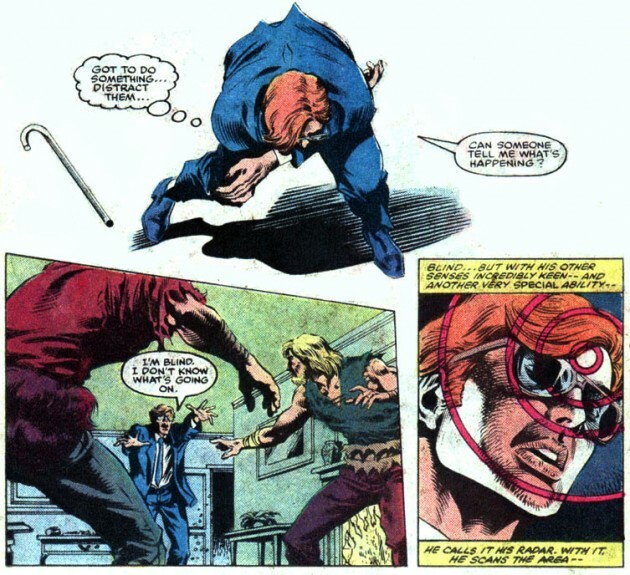 This is a funny final scene with Foggy beaten to a pulp while his wife is more concerned about the brute who punched him. 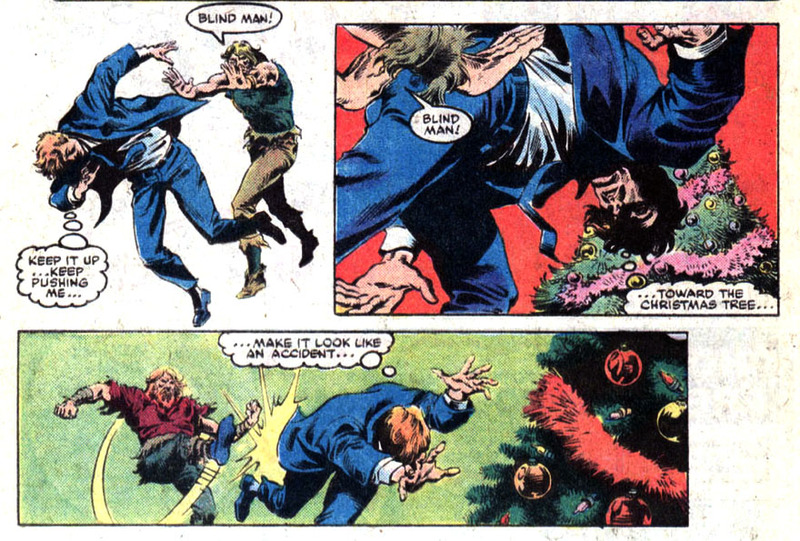 My favourite DD Christmas has to be the one from Daredevil #253, by Ann Nocenti and John Romita Jr. DD teaches a young kid a lesson inspired by the “bread cast on the waters” parable. “If you spend your days giving to people whenever you can, some of that goodness may float back your way just when you need it most.” Nice touching story. Sorry, Glory — I’m going to have to go with Debbie on the dress. 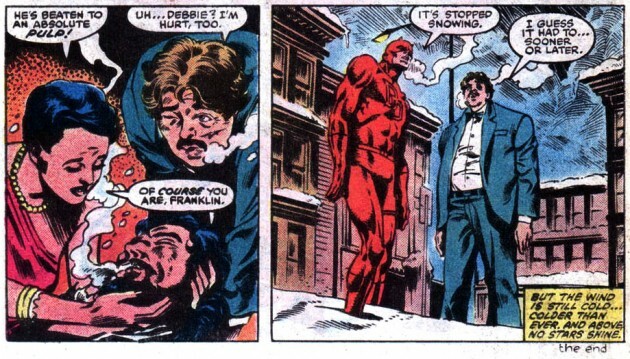 A little bit of snow putting off Power Man and Iron Fist from coming to a party??? Hmmm. Who’d have thunk they’d have been so wussy? Perhaps the Heroes for Hire Christmas party got a little out of hand and they’re still recovering from hangovers? Hey everyone and thanks for commenting! @G: True, Glorianna’s dress is not that great-looking, but I always learned that the worst violation of good etiquette is pointing out someone else’s shortcomings. So, Debbie is not quite as classy as she thinks she is. I’m sure glad Foggy divorced her. @Robert: I was thinking the same thing. Becky the paraplegic can make it to the party, but not Luke with the unbreakable skin? 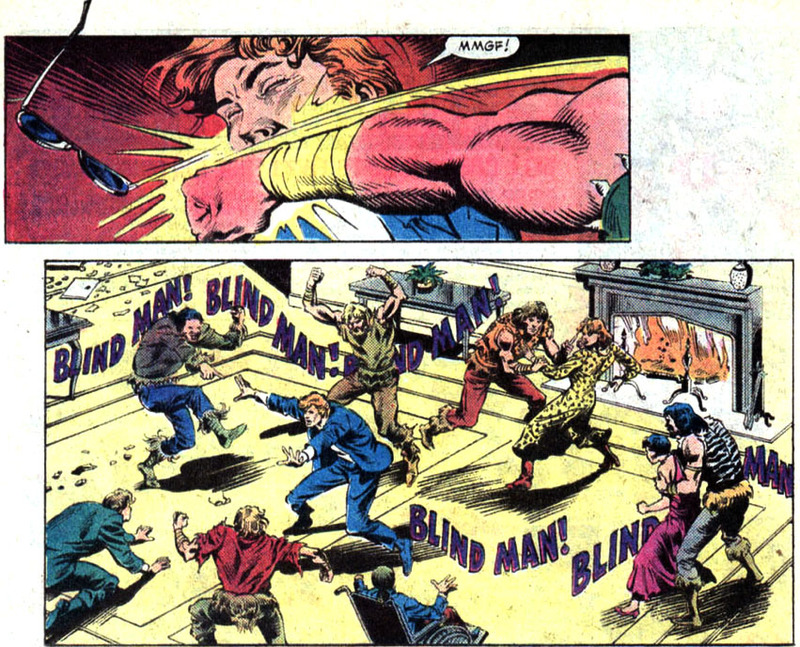 There was probably a better party going on at the Avengers mansion, and they didn’t want to hurt Matt’s feelings.